David Mamet must have suffered a mild aneurysm when he saw About Last Night…, the 1986 adaptation/total betrayal of one of his first hit plays. To say the writer’s voice got lost in translation is an understatement: Somehow, Hollywood managed to convert Sexual Perversity In Chicago, a caustic, profane study of gender warfare in the Windy City, into a laughably schmaltzy date movie. (Last year’s compromised, abbreviated take on August: Osage County looks reverentially faithful by comparison.) Now, almost three decades later, Mamet’s mistreated breakthrough gets another modern makeover, this one set in Los Angeles and starring several members of the Think Like A Man cast. The jokes are funnier, the acting is better, and the montage count has been severely, blessedly reduced. But don’t be fooled by the ellipsis-free title. Despite a few deviations, About Last Night is basically the same sanitized rom-com, bearing the slightest hint of resemblance to its source material. In other words, most of the perversity of Perversity has again been excised—the Chicago too. But about those improved performances: Better stars keep Steve Pink’s remake from sinking to the pitiful lows of its predecessor. 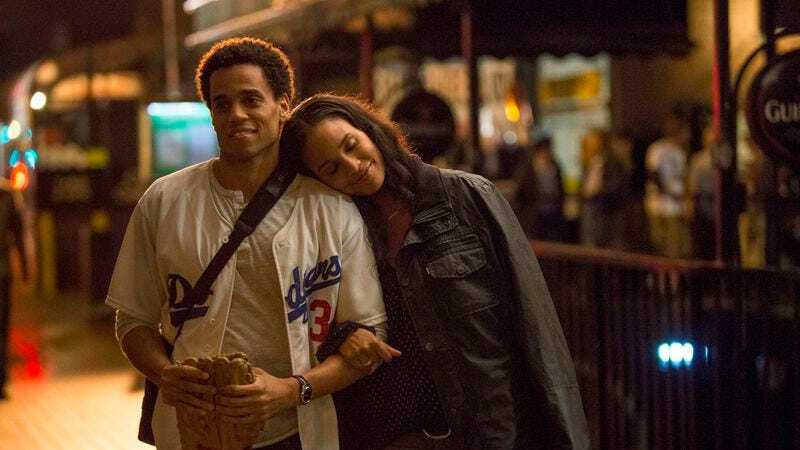 Certainly, Michael Ealy and Joy Bryant generate more heat than the previous occupants of their roles, Rob Lowe and Demi Moore. (That the latter two salvaged careers after their wooden portrayals in the original is something of a miracle.) Unwittingly coerced into a blind double date, Danny (Ealy) and Debbie (Bryant) stumble from meet-cute to one-night-stand to serious relationship. Because men are from Mars, women are from Venus, and toilet seats haven’t learned to put themselves down, these earnest young lovers find their paradise troubled—especially after the two move in together, against the advice of respective besties Bernie (Kevin Hart, taking over for Jim Belushi) and Joan (Regina Hall, in the Elizabeth Perkins role). Parting ways slightly with the ’86 version, as well as Mamet’s blueprint, About Last Night also romantically pairs these supporting figures, whose on-again, off-again fling—and outrageous sexual slapstick—runs parallel to the leads’ ailing romance. In a post-Seinfeld era, there’s nothing especially unique about watching characters discuss, say, the pitfalls of being the first to say “I love you,” or the danger of losing autonomy after moving in with a significant other. The dialogue has the flavor of 2014, even as these paramours simply borrow the dating wisdom—and gender politics—of their 1980s counterparts. (Beyond a split-second shot of someone de-friending an ex on Facebook, About Last Night could easily be set 30 years ago.) The bilious banter of Sexual Perversity has aged, too, but its vision of toxic bachelorhood remains relevant. Someone, perhaps Neil LaBute or even Mamet himself, ought to attempt a closer adaptation of the play, one that doesn’t drain the whole scenario of its scathing cynicism. Of course, that hypothetical version probably wouldn’t feature Hart, whose comedic star is on the meteoric rise, screwing a woman in a chicken mask. Tough tradeoff.